Spring is just around the corner, but she’s been playing peek-a-boo from around that corner for a few weeks now. 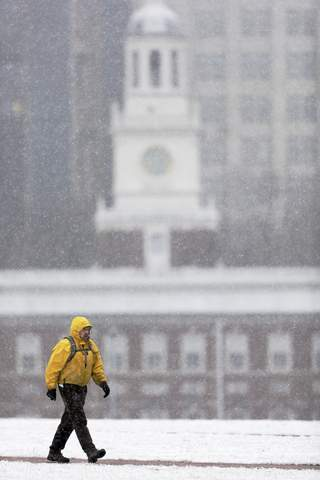 This AP photo was taken on Monday in front of Independence Hall in Philadelphia. The next day was cold and overcast. Today, the sun is shining, a light breeze is blowing and I’m tempted to put away the snow paraphernalia for another year. Can this be the week spring finally decides to give up her childish game and make an appearance? 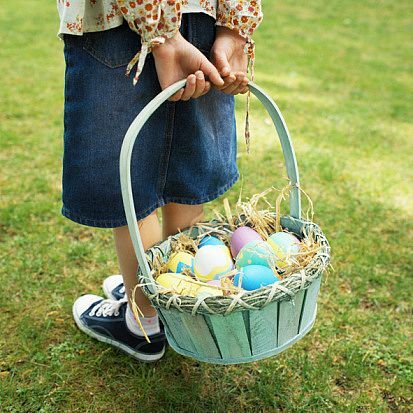 …Just in time for Easter egg hunts on green lawns? 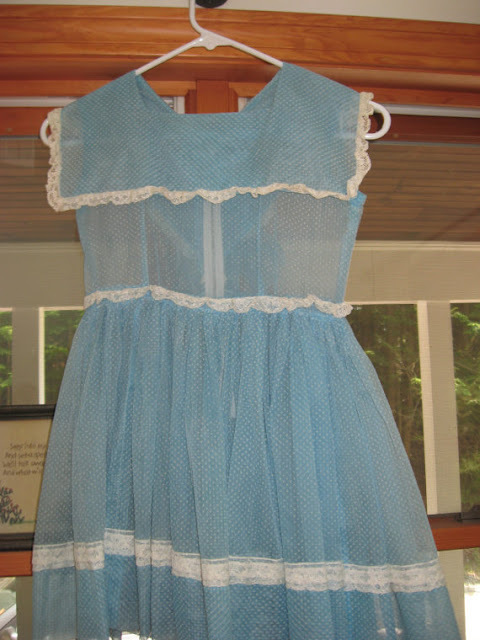 When I think of the Easters of my childhood, I always see myself in a dotted swiss dress. Sometimes it was pink, sometimes white, sometimes blue. Once, it was a beautiful navy blue (my favorite Easter dress), but no matter the color, the pattern was always the same. Dotted swiss, Easter and spring all go together for me. This spring, dotted swiss for big girls, the polka dot, is back, and it’s everywhere. Enfin a fashion trend that everyone can wear! I just adore polka dots (les pois in French)…..
……big ones, little ones and everything in between. They are young and fun, and they make me smile. I already know what you’re going to ask me. Polka dots look great with stripes (also hot this spring). It’s all in the proportions. This is a bold look, mostly because of the bright yellow color, but it all works together beautifully. The polka dots are fairly large, but the stripes on the Tee underneath are narrow. And the polka dots on the shoes are small. This may be a bit much for the average woman to pull off, but it is adorable. This is a great way to mix polka dots and stripes that is easier to pull off for the average (i.e., non-stick thin, vertically-challenged) woman. This young lady has mixed a black-and-white polka dot top with a purple, pin-striped cotton skirt and topped it off with a fringed scarf in mustard and neutral shoes. Notice that the pattern proportions are all small scale and do not fight each other for attention. The pop of color in the scarf adds a bright touch of spring. Of course, if you are still hesitant to dive head first into the polka dot pool, you can always opt for an elegant polka dot scarf. Drape it around your neck or wrap it around your head to instantly transition your look into spring. 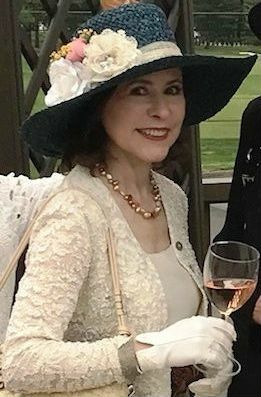 For all things foulards, visit Playing with Scarves to learn everything you need to know about scarves from la reine des foulards, my fabulous friend, Anne Touraine. This photo comes from her Blog, which is an absolute must read. Now it’s your turn. Add some pretty polka dots to your wardrobe this spring. I guarantee it will make you smile every time you look in the mirror. 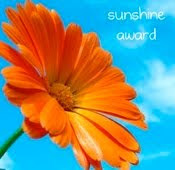 I get lots of e-mails from people asking me to try their products or services and review them on my Blog. 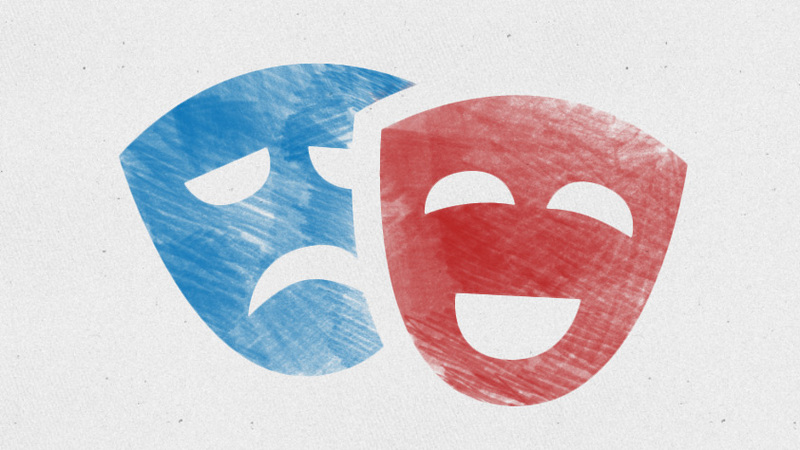 Last week, I was contacted by a site that promises to teach people how to be “happy” through a series of apps. I’m not kidding! Apparently, all you have to do is download an app and you, too, can say bye-bye to the blues and hello to a happier you. Can it really be that easy? Can you just download happiness the way you download a recipe for lasagna? Hmmm. I wonder…..
Well, if that’s the case, here’s my contribution to the Happiness Recipe File. 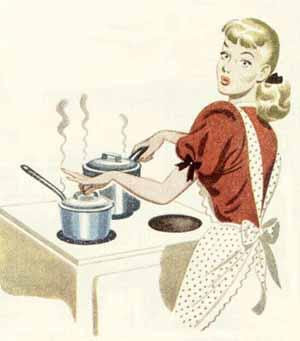 Simmer gently for the rest of your life and enjoy. Remember the ‘80s power suits? No? Oxford-cloth shirts buttoned up to the neck…. Tiny shoulder bags that sneered, “I don’t need all that silly, girlie stuff”…….. Giant briefcases that screamed, “Take me seriously; I’m important”…… and……..
Just rent a DVD of “Baby Boom” with the delightful Diane Keaton and it’ll all come back to you. Fast forward to the Ladies who occupy the halls of power today, and you will see some welcome changes in attire, if not entirely in attitude. Neutrals still play a major role in their wardrobes, but jackets are more form-fitting and flattering. And nobody does neutrals better than former French Finance Minister and current Head of the International Monetary Fund (“IMF”) Christine Lagarde. She has become a fashion icon for the successful woman, and for those striving to become successful, and it’s easy to see why. The pantsuit is a staple in every professional woman’s wardrobe. Hillary Clinton and Nancy Pelosi wear them almost exclusively; however, while they prefer something a bit looser, Lagarde opts for fitted, impeccably tailored versions that flatter her long, lithe body. Most of her suits are made in the English House of Austin Reed. She also pays close attention to accessories, which can take a simple grey suit from stuffy to sophisticated with the fabulous addition of a bright pink clutch and two-toned, kitten pumps. Grey is the color of intellect, knowledge and wisdom. It is dignified, conservative and carries the weight of authority. Because it sits comfortably in the middle between Black and White, it is seen as the color of compromise…the perfect color for a politician who wants to create the appearance of compromise whether he or she is willing to do so or not. Here’s Lagarde in a navy blue suit with ¾-length jacket nipped in just a bit at the waist. The jacket is slightly loose, but the sleeves are beautifully fitted to her slim arms, which avoids a too-masculine, over-sized feel. The spiky gold necklace and starburst brooch kick everything up several style notches, and let’s not overlook the gorgeous Birkin in a warm neutral. The color Blue projects intelligence, efficiency and a willingness to communicate. It has a cool, calming effect, and the person wearing it is the one you turn to in a crisis. This is quintessential Lagarde business style…. The color Black is the ultimate in sophistication and glamour. It projects sleekness and substance. It can make the wearer appear cold and aloof, but not when you take a long scarf in a deep jewel tone, drape it casually around your neck and leave it untied. And the girlish grin captured by this photo as Lagarde bounds up marble stairs on her way to a high-powered meeting makes her look anything but cold and aloof. But, one cannot live by neutrals alone, and the powerful woman can pack a pretty powerful punch with a zesty dose of color in her wardrobe. 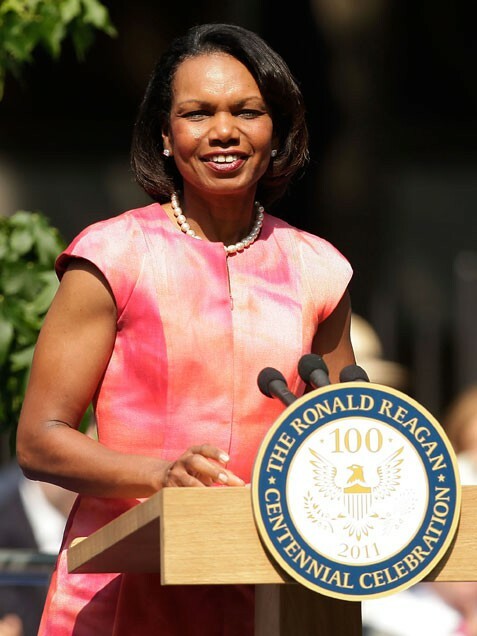 Condoleezza Rice, former U.S. Secretary of State, was famous for her neutrals, often black. These days, the stunning Condi is showing off her toned arms in colorful sheath dresses. These bright colors are so flattering to her warm skin tones. A lifetime of athletic pursuits, such as competitive figure skating, has left her with perfect posture and the confidence that goes with it. Sometimes, Ladies, just standing up straight can get you noticed in a sea of slouchers. Michele Bachmann, U.S. Congresswoman from Minnesota, is a lady who knows the power of bold colors, particularly Red, and the effect they can have. Just like the perfect red lipstick, every woman needs the perfect red dress in her wardrobe arsenal. The color Red projects courage, strength, warmth and energy. It is an aggressive, stimulating color that will always get you noticed. In fact, in this color, you can easily command the room, which is definitely a plus for any politician. Of course, in Bachmann’s case, the total package of brains and beauty is definitely an attention-getter all by itself. Junior U.S. 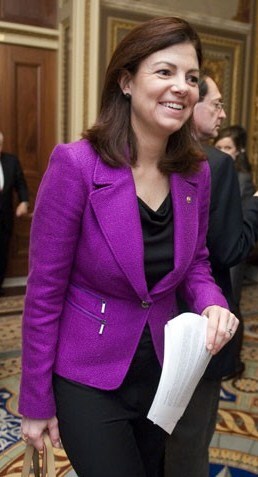 Senator from New Hampshire, Kelly Ayotte, favors jewel-toned jackets. This deep amethyst jacket has wide lapels and tapers to show off her slim waist and slender arms. The color Purple is the color of royalty and luxury and projects spirituality and integrity. Notice that Ayotte is wearing basic black underneath. This works beautifully for the businesswoman, too, because it gets her noticed when she enters the room, but once she removes her jacket, she can get down to business without the distraction of a bright color. Oh, and BTW, Ladies, although known for her neutrals, Christine Lagarde can rock a color with the best of them any day of the week. Yellow is considered a feminine, youthful, creative and optimistic color. The wearer is perceived as friendly, confident and outgoing. It is, however, not an easy color to wear well. It has to be exactly the right shade and, if the fit isn’t perfect, it will add unwanted pounds. Do I hear Big Bird? 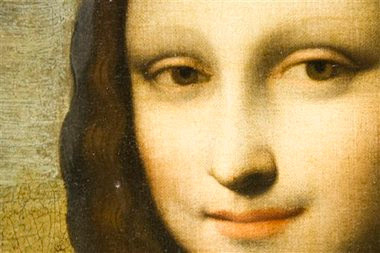 Lagarde has chosen the perfect shade for her skin tone – a light, clear Yellow. And, she has grounded it with touches of Black in her shoes and in her Hermès scarf, once again, draped casually around her neck. 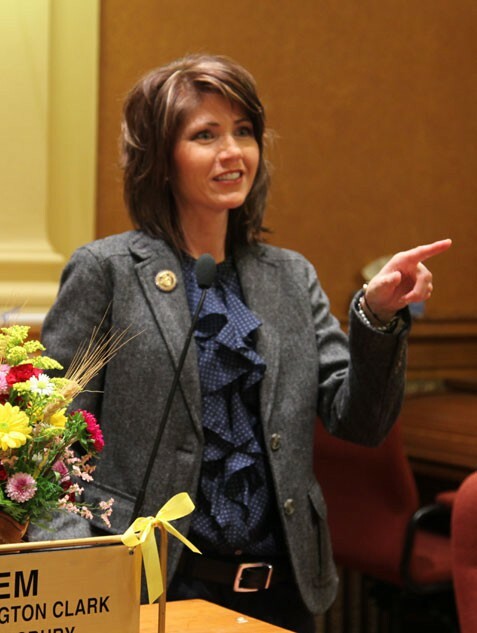 Kristi Noem, a young U.S. Congresswoman from South Dakota, clearly has her own version of power dressing. Considered a rising star on the Washington political scene, her look is a little bit country, a little bit rock ‘n roll and a whole lot her own. Here, the lady-like ruffle adds an unexpectedly feminine touch to her plaid, flannel shirt. The grey tweed jacket is pure classic, but by pairing it with low-rise black trousers and a big, belt buckle, she adds a modern twist. The mix of textures and neutrals is a power look that gets my vote. I don’t know about you, but I’ll be keeping an eye on Ms. Noem. Will she be the new American fashion icon for power dressing in the halls of power? Look out, you D.C. Good Ole Boys, there’s a new Sheriff in town, and she’s packin’….some serious style. Photos of Christine Lagarde courtesy of AFP/Getty Images. All other photos courtesy of iVillage. We are now in the season of Lent, which means meatless Fridays for all of us Catholics until Easter Sunday. This is supposed to be a big sacrifice, and for many, like my Mother, it is. But not for me. If I had my way, I’d eat fish every day of the week. I am truly my Father’s daughter. During the Lenten season, everyone is supposed to give up something that he or she likes. It’s a small, symbolic sacrifice that reminds one of what the Christian martyrs sacrificed by giving up their lives for Christ. Since I’m clearly not the stuff of which martyrs are made, I always give up something for Lent that I’m not too keen on anyway, like sweets. I suppose I should feel a twinge of guilt, but so far......nothing, nada, rien. 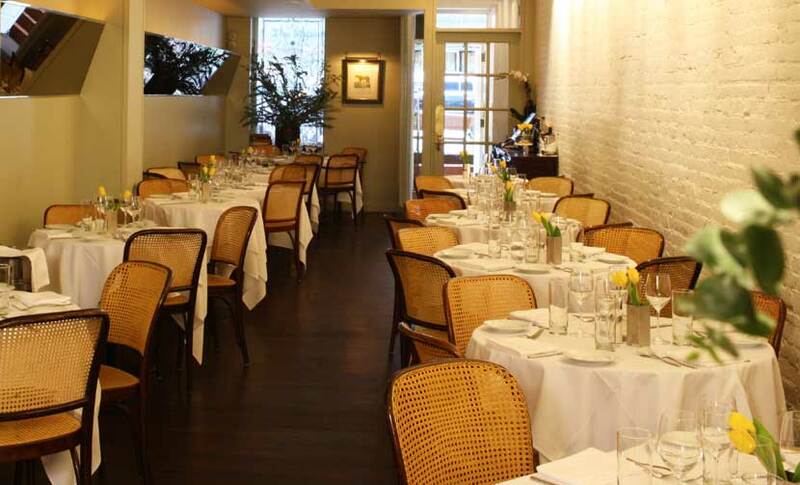 Anyway, a few Friday nights ago, my husband and I were at Il Gattopardo (“the Leopard”), a terrific Italian restaurant on 54th Street in Manhattan. Among the specials on offer that night was a whole branzino, which, the waiter assured me, would be filleted at tableside. “Oh, very good, Madame” our waiter replied, looking ever so relieved. Serving a whole fish to American diners is simply not done. Maybe it has something to do with the eyes staring up at them or the fear of swallowing a tiny bone and choking to death. Or..…maybe it’s just that Americans don’t like to work for their food the way the French do. For me, it’s a bonding experience. Whether I’m lovingly pulling off the leaves of an artichoke, one by one, and dipping them into the sauce, cracking a crab with my bare hands or carefully and methodically deboning my fish, I am one with my food. I have my own method of filleting fish, taught to me by my Father, who knew a thing or two about fish. 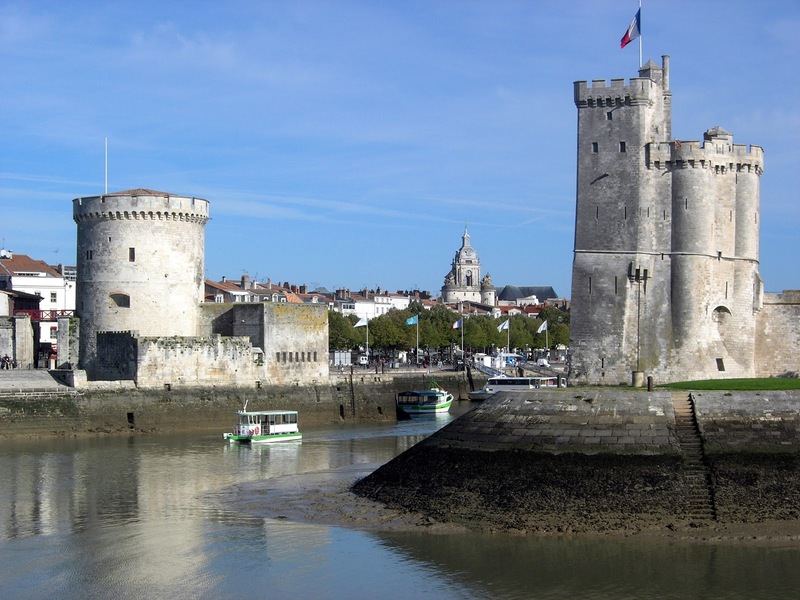 He was born and raised in La Rochelle, which sits right on the Atlantic Ocean. The sea was in his blood, and the bounty it provided was daily on my Grandmother’s dining table. His Father was the head chef in a prestigious local restaurant, but he always said that it was his Mother who was the superior cook. 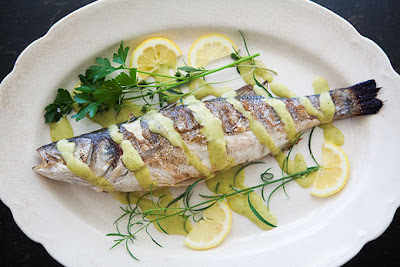 Whole fish in American restaurants are filleted either in the kitchen or at tableside and then presented to the diner. It’s often a lovely presentation. But, I prefer to do it myself, as I go, so to speak. Here’s how I do it. Step 1: With my knife, I cut crossways just behind the head to loosen the flesh while leaving the central bone that runs lengthwise intact. Step 2: With my knife, I cut lengthwise from head to tail, right down the center to loosen the flesh while still leaving the center bone intact. Step 3: With my knife, I carefully peal back the skin on one side of the fish from behind the head to the tail. Step 4: With my knife, I separate the flesh by pulling it away from the center bone, being careful not to disturb the tiny bones. At this point, the waiter or Maitre d’ in an American restaurant will repeat the process on the other side and carefully lift off the head, center bone and tail, which should come out easily in one piece, and set it aside. He will then sauce the fish and present it to the diner. My Father taught me to leave one side covered while I eat the other side. This ensures that the uncovered flesh remains juicy and warm until I’m ready to enjoy it. Step 5: Once I have enjoyed both sides, I then remove the head, center bone and tail and enjoy the flesh underneath, which is still juicy and warm. If you’ll pardon the introduction of sweet into a savory discussion, it really is du gateau….a piece of cake. With a little practice, you can master it in no time….trust me. You'll never eat a whole fish any other way again. 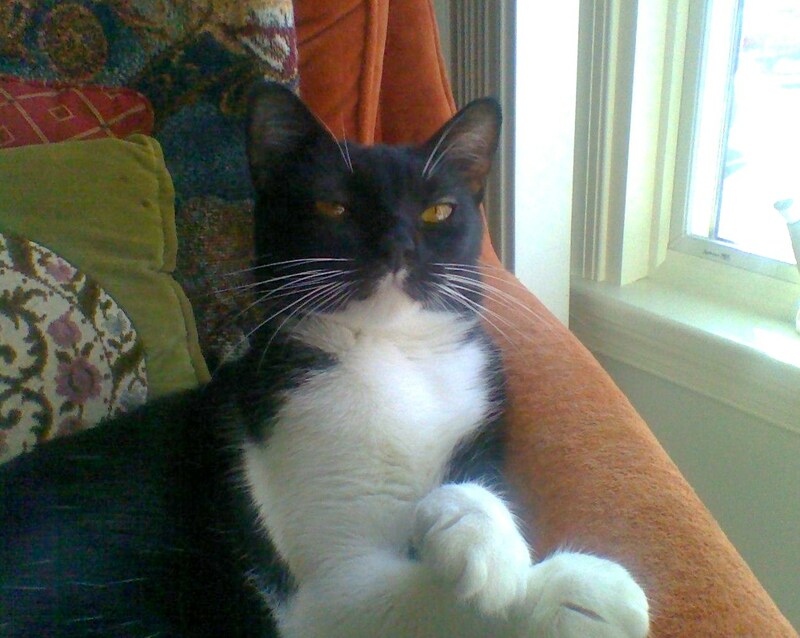 I taught my Irish-American husband to do this in one easy lesson, and he took to it like……..well…...a fish to water. Of course, he gets the same “Are you sure you know what you’re doing?” looks from startled waiters when he insists on filleting the fish himself; but he just says, “My wife is French and she knows what I’m doing.” ….point à la ligne….end of discussion.